For Newsome the good ol’ days meant he took care of the parking lot and ran his own shoe shine parlor in the Santa Barbara Plaza. Now there’s only one beauty salon left where he mops the floor. The Los Angeles shopping center has been a mess so long, it is hard to find someone with a genuinely good memory. For two decades the property has been in a state of flux, never moving forward, slowly dying, taking with it such places as the Boulevard Cafe, a meeting place for the movers and shakers of the city. Once home to 230 locally serving businesses, many owned by locals, the center rose in the ’40s and ’50s and thrived for decades with its sister center, the Crenshaw Center. They’ve been hailed as one of the oldest regional shopping center in the country, anchored by Broadway, May Co., Vons, Woolworth’s, Boy’s SuperMarket, Lerner’s, Barker Brothers. Eventually major improvements were needed for both centers. The city was able to save the Crenshaw Center and fostered a $150 million makeover, turning it into the enclosed and newly renamed Baldwin Hills Crenshaw Plaza in 1988, one of the best performing malls in the country. Four years ago 20 companies vied to buy the malls and Capri Capital of Chicago took the prize for $136 million. Los Angeles officials considered doing something about the neighboring 20-acre shopping center around the time Ruth Galanter first took her seat on the Los Angeles City Council in 1988. She worked to get something done on the site for 10 years without success. Santa Barbara, already in need of repair, languished. Uunlike Crenshaw Plaza, each building had a different owner and the owners couldn’t come to a consensus, Galanter said. “They were very worried about what the mall development was going to do to their business and they were right to be worried,” Galanter recalled. “They wanted the redevelopment effort to help their businesses. The problem was, it was all privately owned but the parking lot was under complicated series of covenants. “Each property around the edge had rights in the parking lot but did not own a specific piece. There was a similar problem in Westchester. It must have been in fashion in the ‘30 and ‘40s.” After the riots in 1992 the city again focused on resuscitating Santa Barbara Plaza, deeming it a redevelopment area, opening up opportunities to raise more tax money. It was clear that there was going to be wholesale changes. Buildings were going to be torn down and ownership would change. Instead it was the relatively unknown Chris Hammond, who broke ground in 2003 flanked by Mayor Jim Hahn and Keyshawn Johnson. Hammond changed the name to Marlton Square and proposed a $123 million mixed-use plan (at the upper end the estimated value was $169 million). The Council responded with a public investment package of about $40 million. It was a grand plan with a 140,000-square-foot lifestyle community-serving retail center, 140 single-family homes, 180 units of affordable senior apartments and park space. The finanicial aid package could have included loans against future sales taxes and property taxes, federal Housing and Urban Development grants and loans, and local public grants. The development team was supposed to have supplied $35.0 million and find a loan for the remaining $45 million. Hammond took over and got the city’s blessing in 2001. He didn’t go bankrupt until 2008.
crumbling Santa Barbara Plaza, the Bedford Parc Promenade condos rose just a couple of years ago, a much smaller Redvelopment Agency project. In addition to the Crenshaw Plaza with its Macy’s and Sears, a Fresh and Easy is planned just a mile south, and Target is moving in just few miles north. 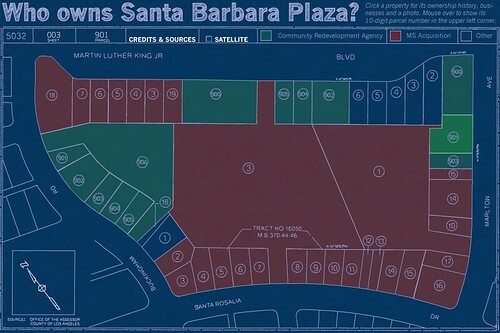 Granted South Los Angeles has more than its share of vacant lots and abandoned buildings, but Santa Barbara Plaza is larger than the Century Mall, the size of 20 football fields. Though the mid-century design with googiesque signs and graphics was recently slathered in white paint, it somehow still evokes the bygone era of a bustling center. When Garcia cuts through the parking lot to catch the bus by his house, he passes by Best TV repair, which sits inside in one of the most neglected areas of the center – one storefront has been torched, a pile of wood sits outside and pot holes fill the parking lot.